Art flourished in France to an exciting and unprecedented degree in the 19th century. Sculpture was a part of this fantastic explosion of creative genius with such artistic giants as Rodin, Barye, d’Angers and Carpeaux. At the same time technological advances in the bronze industry transformed sculpture from an art form for public plazas and the rich to art for living rooms and vestibules of even the middle class. 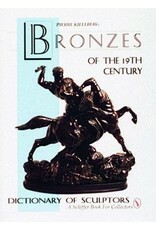 The result has been an abundant supply of nineteenth century French bronzes-some common reproductions, and some extremely valuable limited editions. In this important reference, you can discover a wealth of information.This extraordinary volume contains a complete encyclopedia of almost 750 French artists, with biographies, listings of works (along with size and foundry when known), museum pieces in France and elsewhere, and recent sales. It also includes an overview of 19th century bronze sculpture, the foundries that cast the bronzes, and methods used to cast works. 1000 photographs capture the beauty of the pieces and help identify these and similar works.